The prehistory,and indeed often the history, of Armenia always faces the same problem. Is it essentially a suburb of Iran, or rather of Mesopotamia as a whole? Or should we look north, to the Central Asia for ideas and inspiration? Or was Armenia something unique, hidden away in the Caucasus where there was a special Caucasian culture often rather divided as the Caucuses themselves are divided by high mountains? The question comes to the fore in the Early Bronze Age. This was the time when the urban culture was flourishing in northern Mesopotamia, when cities were growing and writing was being invented. However in the Caucasus a different form cities were emerging, with some similarities to those of Mesopotamia but with a character all of their own. In my youth, I knew this as the Kura Araxes culture spread between the rivers Kura and Araxes, which flow roughly down either side of Armenia but which then join together in Azerbaijan and flow out into the Caspian Sea. 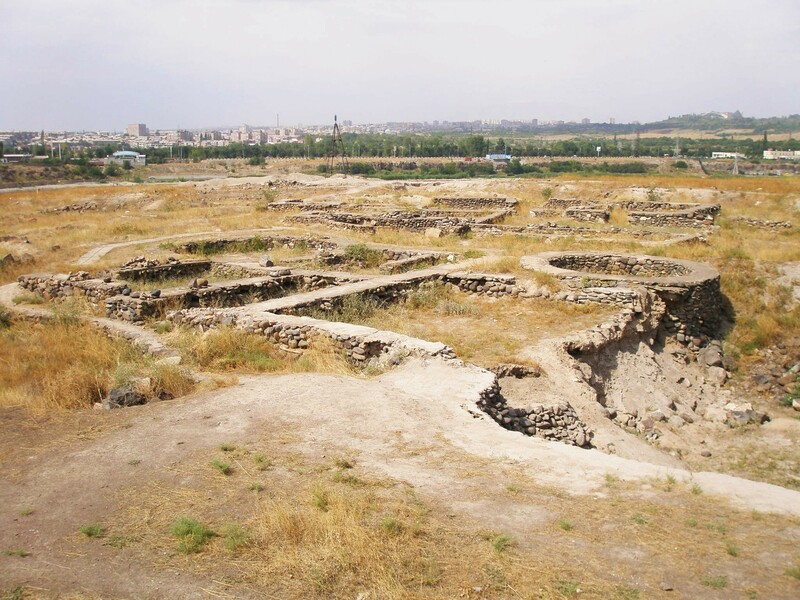 One of the major cities of the Kura Uraxes culture is Shengavit, so that it is sometimes called the Shengavit culture. 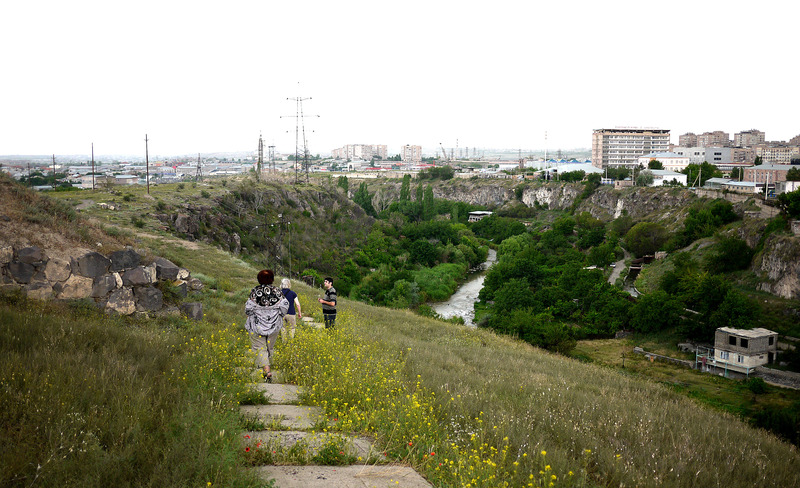 Shengavit lies in the suburbs of Yerevan: there are two major archaeological sites in the suburbs of Yerevan, the better-known being the Iron Age site of Erebun which lies to the south-east and which we will be discussing later; Shengavit lies to the south-west. Shengavit lies on a low hill just beyond the south-western suburbs of the city, but in the 1970s the Soviets came along and decided it would be an ideal site for a new hospital and despite the protestations of the archaeologists, erected a hospital which now occupies over half the area of this very extensive hillfort town. 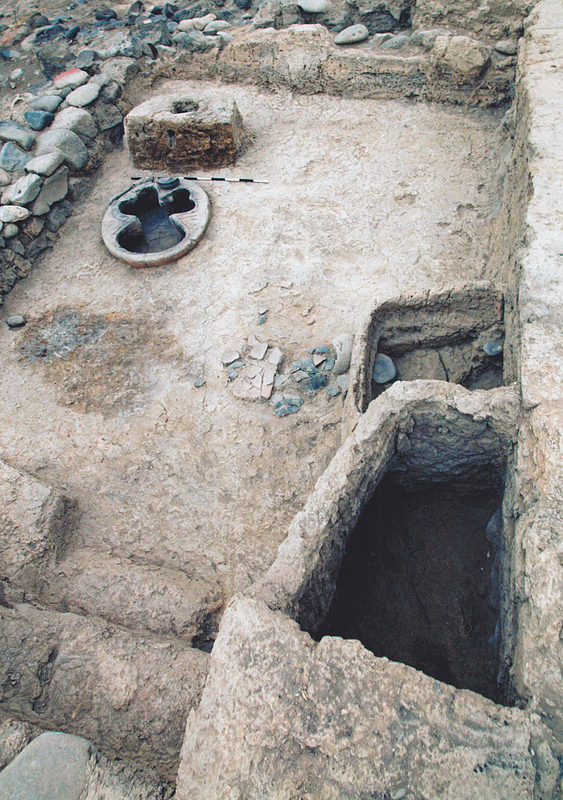 Shengavit was first discovered in 1936 by the archaeologist Eugenie Baburtian but it was the extensive excavations of Sandro Sardarian from 1958 to 1983 that revealed the extent of the site. Since 2000 further excavations have been carried out by Hakob Simonain, and in some years, an American team. 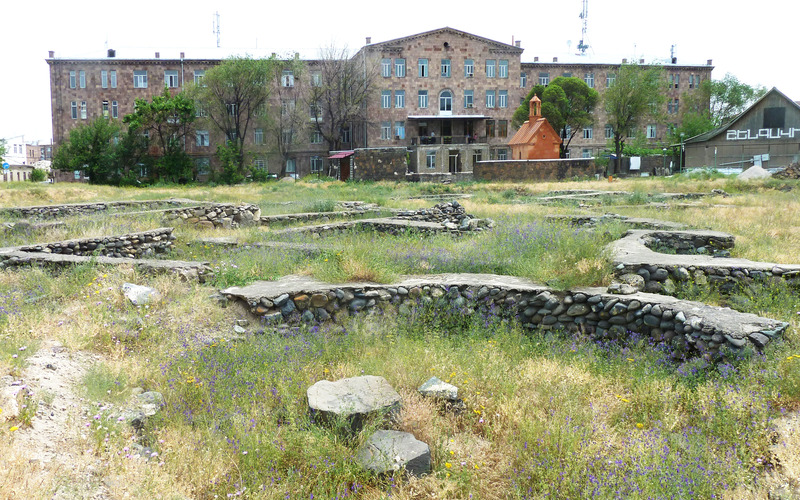 The Shengavit Hospital, with some of the excavations in the foreground (Contemporary note: the hospital; was built in the Soviet era, but note the little red chapel recently added in front of it, in defiant opposition to the soviet ideals. And note too the Visitor Centre /Museum to the right, which they would dearly love to have properly upgraded). Does the town have any walls? Three aspects can be considered. Firstly there are the walls. It was a walled city with the walls in places being strengthened by casements or bastions. 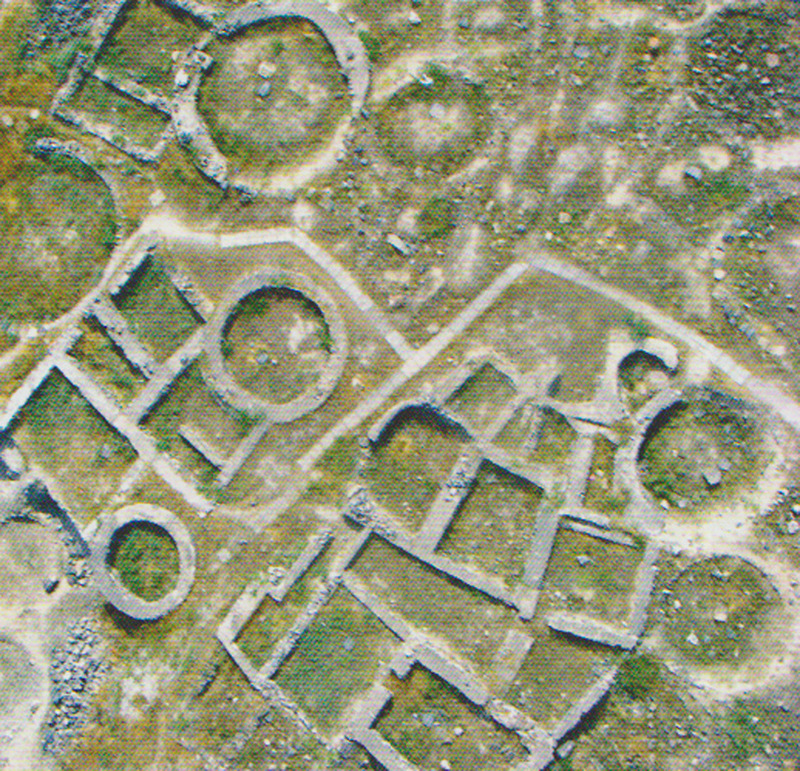 Secondly a substantial area has been excavated in the centre showing a jumble of roundhouses and some rectangular, but mostly contiguous to each other so that it is difficult to know how they all joined up. 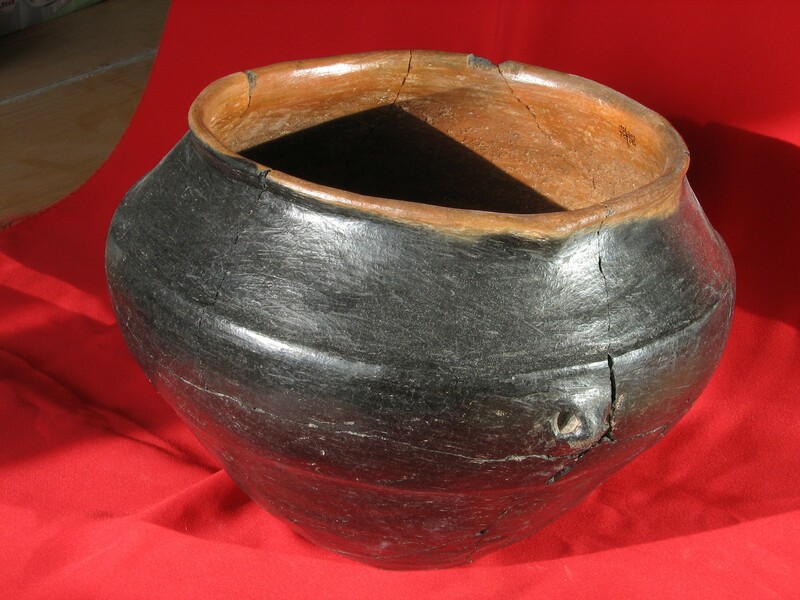 But in the earlier excavations, fragments of 9 pots with a copper sediment were found, suggesting that copper smelting may have taken place on the site. There is thus a mass of buildings, but so far, there has been no sign of a palace or a temple, so was it really more than a large village? Last year however Hakob discovered what he believes to be a temple. This is a rectangular semi-subterranean structure approached by two steps leading down into it. In the far corner was a low ‘altar’ a clay block with a crude decoration on the front and a hole in the centre which the excavator believes may have held a wooden idol. In front of it was one of the cloverleaf shaped terracotta hearths that are commonly found in Shengavit and which may have had a ‘ritual’ function. Beside the hearth was an open vessel (see photo) – for pouring libations? Then in the opposite corner – the right-hand corner as you enter, are two bins in which the ashes from the sacred fire were placed. Apparently the ash was sacred and had to be preserved. 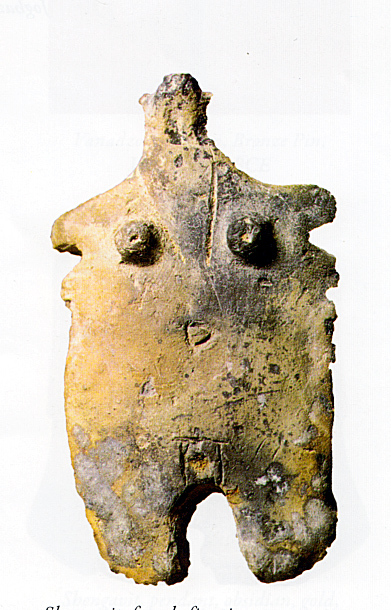 In the fill a phallic pendant idol was found(see below) which may have been the distinguishing mark of the priestess. 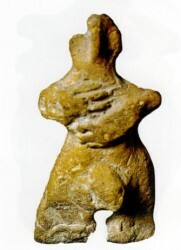 A number of other terracotta figurines were found – to the near right we illustrate a particularly fine female figurine – not dissimilar to those found at much the same time in the Vinca culture in the Balkans. 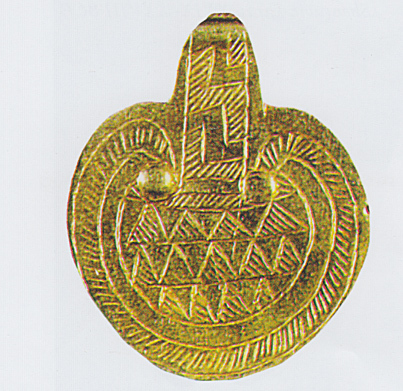 Far right is a fine gold pendant that has also been recently discovered. Well how far is Shegavit a proper town? Well, there is no palace – yet – but there is a temple or at least a large shrine. What does one need to make a proper town? It is a large walled settlement, it lasted for over a millennium, starting around 3500 and ending 2,600 or possibly even as late as 2,000 BC. It is beginning to look like a proper town.